From Albuquerque, we headed north past Santa Fe and eastward to Las Vegas. Las Vegas, New Mexico. We chose Las Vegas as our hub for this leg of the trip because the elevation in Santa Fe made it a bit too cold and snowy to park the trailer (but happily not too cold to visit), and while we loved Santa Fe, we would have missed Las Vegas if we had not camped there. 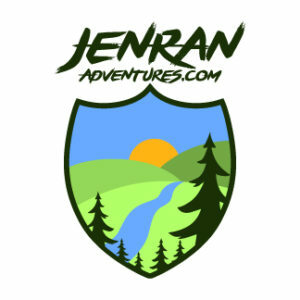 We started our adventure in this part of New Mexico out in nature, with a visit to the Las Vegas National Wildlife Refuge, a 8,672-acre park established in 1965, consisting of marsh, open water, prairie, cropland, and timbered canyons. It is one of the few sizeable wetland areas remaining in New Mexico. 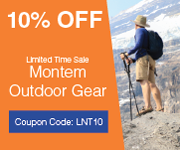 It’s location is unique — with the Rocky Mountains to the west, the Great Plains to the east, and the Chihuahuan Desert to the south. Las Vegas — whose name comes from the Spanish for meadow — is located on a plateau in the foothills of the Rocky Mountains. The refuge is located along the Central Flyway (one of four flyways for migratory birds in North America) and plays a vital role for resting, feeding, and wintering for migrating geese, ducks, and cranes. The refuge is also home to antelope, mule deer, wild turkeys, and coyotes — as well as 24 species of raptors. 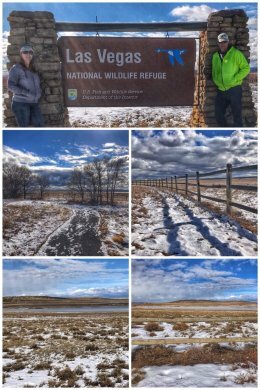 While the visitor center was closed because of the continuing Federal Government shutdown, we were still able to hike the Meadowlark Trail, (located near the closed visitor center). We also drove part of the 8-mile auto loop through the refuge, but because part of the loop is a dirt road that was muddy and slippery from the snow and slush, we decided to forgo the whole loop — as well as the 2.2-mile Gallinas Nature Trail. Atchison, Topeka and Santa Fe Railroad in the late 1800s. And the railroad did more than end the need for the Santa Fe Trail. For many years, Las Vegas was two towns — with two different downtowns just blocks apart. West Las Vegas — or Old Town — was founded in 1835 by Spanish settlers and laid out in the traditional Spanish Colonial style; but once the railroad arrived, East Las Vegas — or New Town — popped up, and it was laid out on a grid of streets and parks reminiscent of Eastern cities. While both parts are now one town, rival school districts still exist — as do the two downtowns. 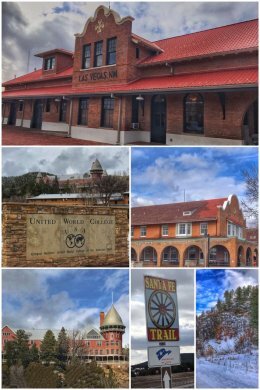 Las Vegas has more than 900 buildings listed on the National Register of Historic Places — but none are more fascinating to us than three related to the railroad — including the Las Vegas Railroad Depot, Castaneda Hotel, and Montezuma Castle. The depot has been restored and has a nice little visitor center. The hotel — a mission-style Harvey House built in 1898 that was Fred Harvey’s first trackside hotel for the Sante Fe Railway — sat abandoned for almost seven decades, but is currently undergoing a $3 million renovation to restore it and reopen it. One last bit of trivia about the original Las Vegas. Like Albuquerque, the town and surrounding areas have been locations for numerous movies, including: Easy Rider, Red Dawn, Wyatt Earp, All the Pretty Horses, No Country for Old Men. 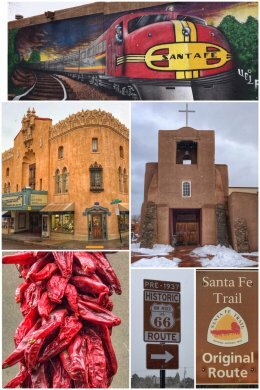 We ended this visit with an extended stay in Santa Fe, which sits in the Sangre de Cristo foothills of the Rocky Mountains, and is one of the oldest cities in the United States — founded as a Spanish colony in 1610. New Mexico’s capital is known both as an arts community (with more than 250 galleries — a gallery on just about every corner) and for its Pueblo-style (Spanish Revival) architecture. It also has more than 400 restaurants and 20 major museums (including the Georgia O’Keeffe Museum). 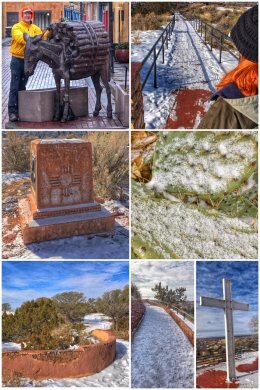 We ended our visit in Sante Fe with a hike to the Cross of the Martyrs and Historic Fort Marcy Park, located on the north side of town. The 25-foot high cross sitting on a hill above the city, is a monument to 21 Franciscan Fathers killed in the Pueblo Revolt of 1680 against the Spanish. On your hike up to the cross, you can read fascinating bits about Santa Fe’s history. Fort Marcy was constructed in 1846 at the outset of the Mexican-American War, following the invasion and capture of Santa Fe by the U.S. The fort on the top of the hill provided the troops with a clear view of the town in case of any uprisings — as well as sending a message to the residents of Santa Fe that they had a new government. While the fort is listed on the National Register of Historic Places, there is really nothing left of the fort but some minor ruins. Before we left the Santa Fe area, we decided to drive north in an attempt to see where Ansel Adams shot his famous photo, Moonrise, Hernandez, New Mexico, along a stretch of US 84. While we were unsuccessful in finding the exact location, we happily ended the day at what became one of our favorite wine tastings… at Black Mesa Winery, in Velarde — about 45 minutes from either Santa Fe or Taos — and which uses only New Mexican grapes in their wines. We loved everything about this winery — which sells wines, hard ciders, and hooch. They are perhaps best known for their sweet Black Beauty Chocolate Dessert wine, which we did not taste. We left with a bottle each of their 2015 Tempranillo, 2014 Zinfandel, 2014 Zinfandel Reserve, 2015 Dolcetto, Bite Me Raspberry (hard cider), and Apple Delight (hooch). You get six tastings for $8 — which also includes a souvenir wine glass. 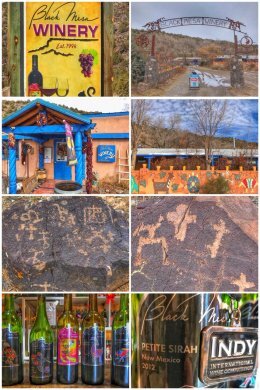 After the wine-tasting, we walked out behind the winery and walked their Petroglyph Trail, which has obvious signs of Spanish carvings of crosses. No question, make visiting Black Mesa a part of your travels — it’s the perfect stop if traveling between Santa Fe and Taos — or if you’re staying at either. By the way, Santa Fe has also been used for several movies and television series, including: Cowboys & Aliens, True Grit, Doc West, Georgia O’Keeffe, Comanche Moon, No Country for Old Men, The Astronaut Farmer, Jane Got a Gun, and The Longest Yard. Next up we risk our lives with a stop in Roswell and a chance close encounter with aliens of the outer space variety. Previous Post:Stop 68: We Made a Right Turn at Albuquerque!